2016 Chase Elliott #24 Kelley Blue Book / Chevrolet SS NASCAR diecast, by Action. 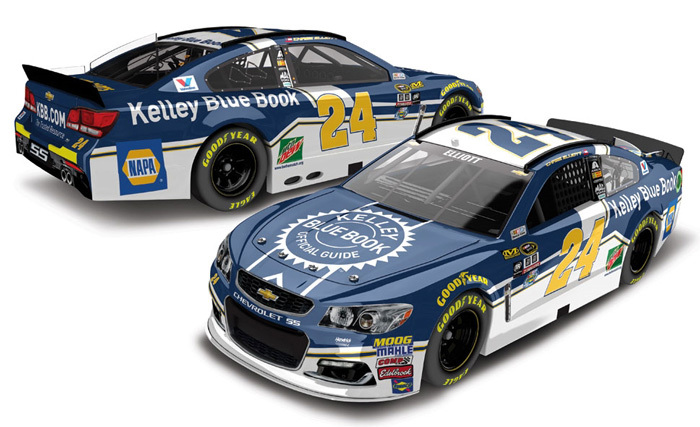 The Hendrick Motorsports #24 Kelley Blue Book Chevrolet SS was raced by Chase Elliott in select events during the 2016 NASCAR Sprint Cup season. 2016 Chase Elliott #88 TaxSlayer.com / Chevrolet Camaro NASCAR diecast, by Action. 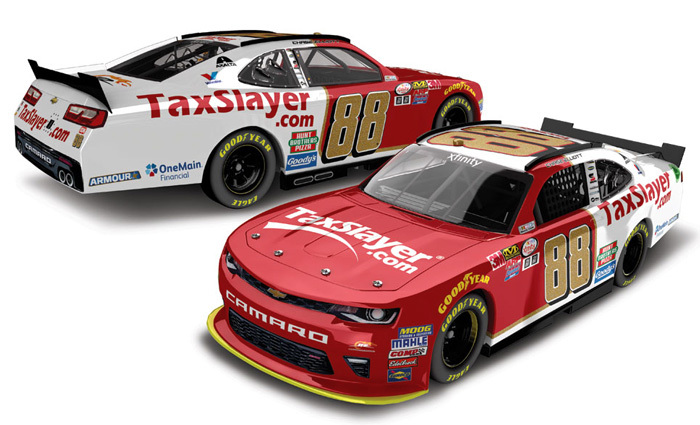 The JR Motorsports #88 TaxSlayer.com Chevrolet Camaro was raced by Chase Elliott in select events during the 2016 NASCAR xfinity Series season. 2016 Denny Hamlin #11 Sport Clips / Darlington / Toyota Camry NASCAR diecast, by Action. 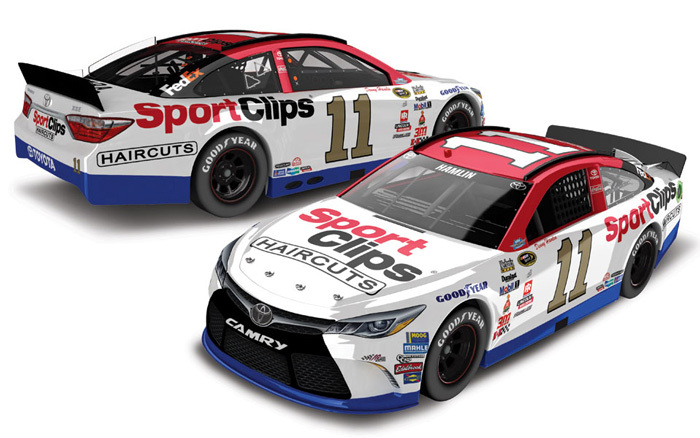 The Joe Gibbs Racing #11 Sport Clips Darlington Toyota was raced by Denny Hamlin in the NASCAR Sprint Cup, Bojangles' Southern 500 at Darlington Raceway on September 4, 2016. 2016 Kevin Harvick #4 Busch Light / Chevrolet SS NASCAR diecast, by Action. 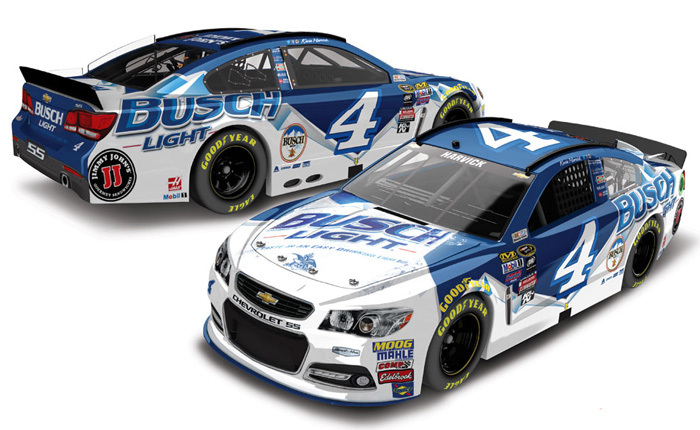 The Stewart-Haas Racing #4 Busch Light Chevrolet SS was raced by Kevin Harvick during the 2016 NASCAR Sprint Cup season. This diecast car will be displayed on a clear base. 2016 Kevin Harvick #4 ditech / Chevrolet SS NASCAR diecast, by Action. The Stewart-Haas Racing #4 ditech Chevrolet SS was raced by Kevin Harvick in select events during the 2016 NASCAR Sprint Cup season. This diecast car will be displayed on a clear base. 2016 Kevin Harvick #4 Outback Steakhouse / Chevrolet SS NASCAR diecast, by Action. 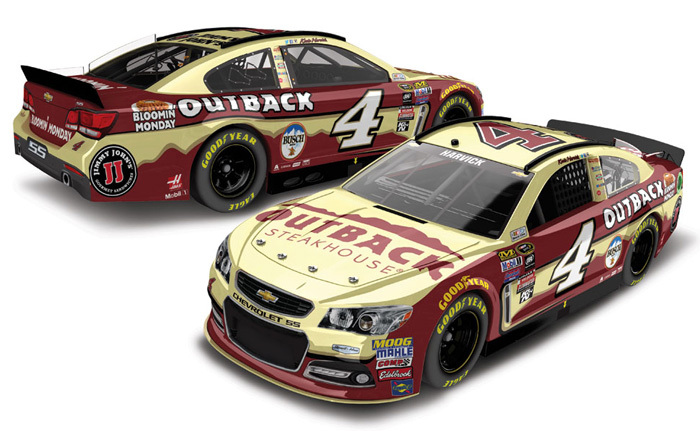 The Stewart-Haas Racing #4 Outback Steakhouse Chevrolet SS was raced by Kevin Harvick in select events during the 2016 NASCAR Sprint Cup season. This diecast car will be displayed on a clear base. 2016 Kevin Harvick #4 Mobil 1 / Chevrolet SS NASCAR diecast, by Action. The Stewart-Haas Racing #4 Mobil 1 Chevrolet SS was raced by Kevin Harvick in select events during the 2016 NASCAR Sprint Cup season. This diecast car will be displayed on a clear base. 2016 Kevin Harvick #4 Busch Beer Hunting / Chevrolet SS NASCAR diecast, by Action. 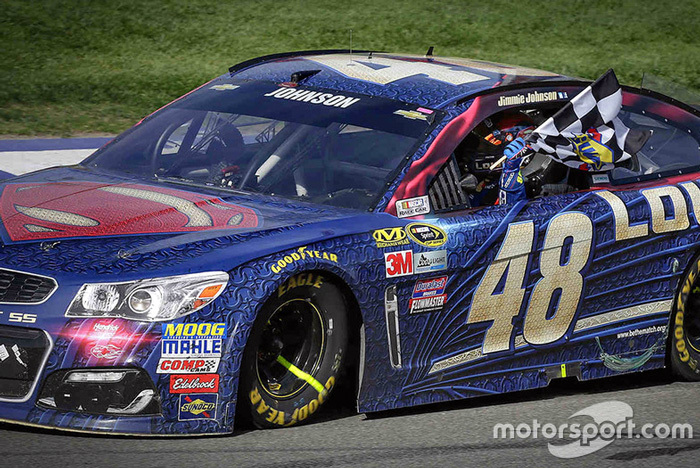 The Stewart-Haas Racing #4 Busch Beer Hunting Chevrolet SS was raced by Kevin Harvick in the NASCAR Sprint Cup, Bank of America 500 at Charlotte Motor Speedway on October 9, 2016. Instead of Busch's traditional blue and white colors, the Hunting cans will feature the beer's "blaze orange" design. This diecast car will be displayed on a clear base. 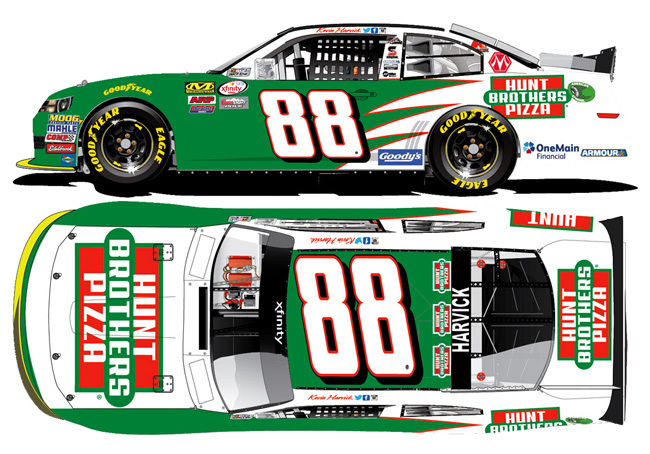 2016 Kevin Harvick #88 Hunt Brothers Pizza / Chevrolet Camaro NASCAR diecast, by Action. The JR Motorsports #88 Hunt Brothers Pizza Chevrolet Camaro was raced by Kevin Harvick in select events during the 2016 NASCAR xfinity Series season. 2016 Kevin Harvick #88 Bad Boy Buggies / Chevrolet Camaro NASCAR diecast, by Action. 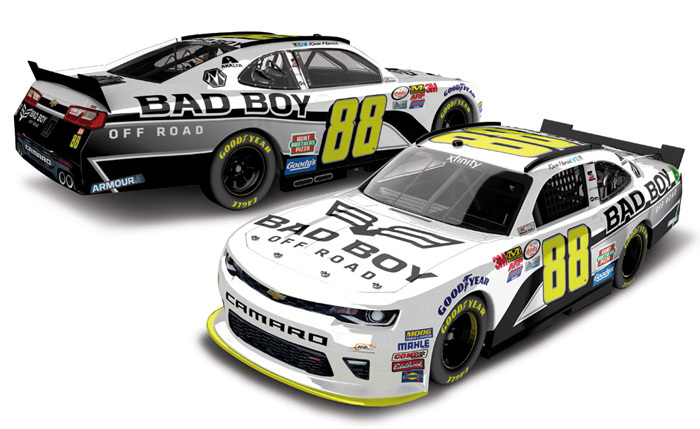 The JR Motorsports #88 Bad Boy Buggies Chevrolet Camaro was raced by Kevin Harvick in the 2016 NASCAR xfinity Series, Heads Up Georgia 250 at Atlanta Motor Speedway on February 27, 2016. 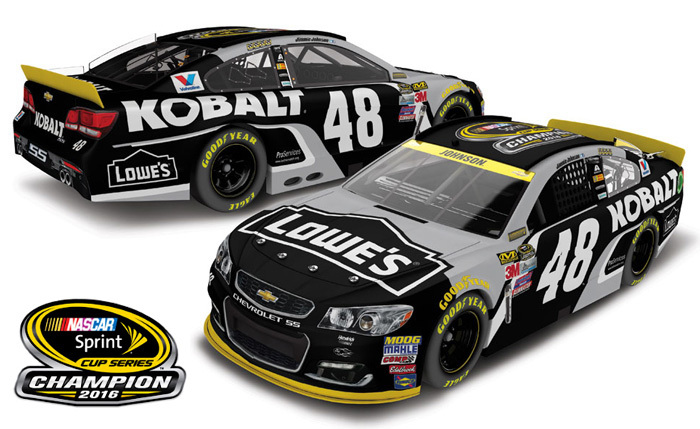 2016 Jimmie Johnson #48 Kobalt Tools / Chevrolet SS NASCAR diecast, by Action. 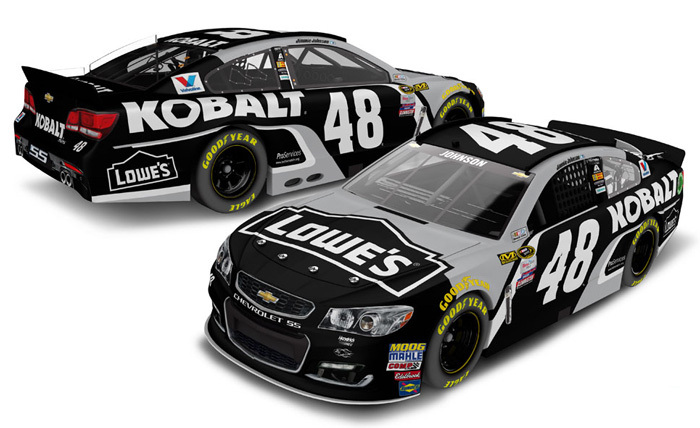 The Hendrick Motorsports #48 Kobalt Chevrolet SS was raced by Jimmie Johnson during the 2016 NASCAR Sprint Cup season. 2016 Jimmie Johnson #48 Kobalt Tools / NASCAR Sprint Cup Champ / Chevrolet SS NASCAR diecast, by Action. This diecast car features the 2016 NASCAR Sprint Cup Series Championship logo on the roof. 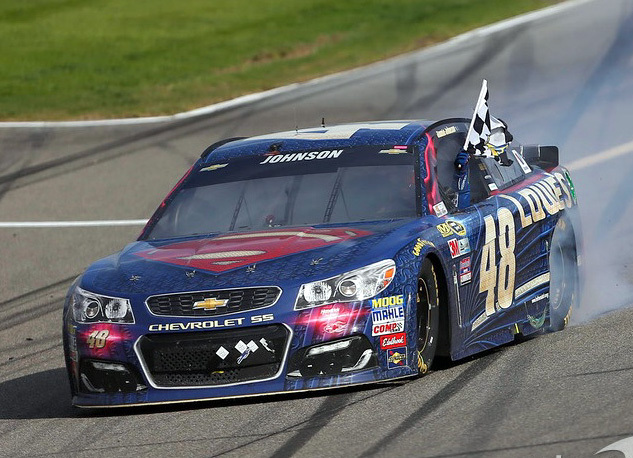 Jimmie Johnson, the 2016 and now 7x NASCAR Sprint Cup Champion! 2016 Jimmie Johnson #48 Lowe's ProServices / Chevrolet SS NASCAR diecast, by Action. 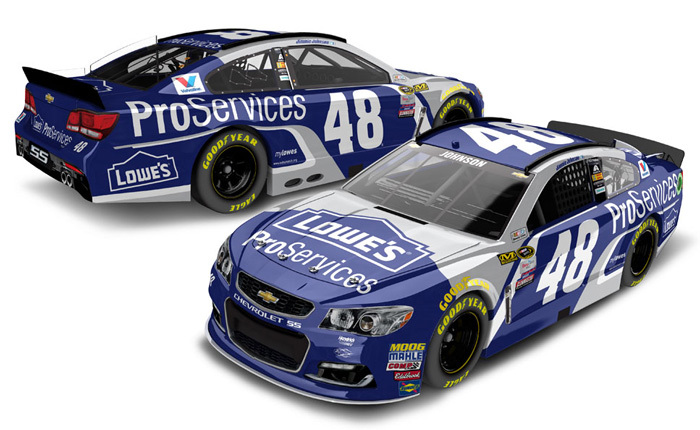 The Hendrick Motorsports #48 Lowe's ProServices Chevrolet SS was raced by Jimmie Johnson in select events during 2016 NASCAR Sprint Cup season. 2016 Jimmie Johnson #48 Lowe's / Power of Pride / Chevrolet SS NASCAR diecast, by Action. 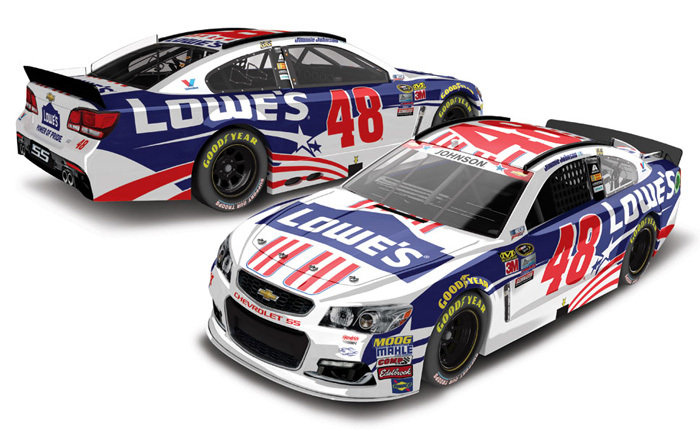 The Hendrick Motorsports #48 Lowe's Power of Pride Chevrolet SS was raced by Jimmie Johnson in 2 NASCAR: An American Salute events, the 2016 NASCAR Sprint Cup race at Charlotte Motor Speedway in May and Daytona International Speedway in July. 2016 Jimmie Johnson #48 Lowe's / Red Vest / Chevrolet SS NASCAR diecast, by Action. The Hendrick Motorsports #48 Lowe's Red Vest Chevrolet SS was raced by Jimmie Johnson in the NASCAR Sprint Cup, Crown Royal (Brickyard) 400 at Indianapolis Motor Speedway on July 24, 2016. 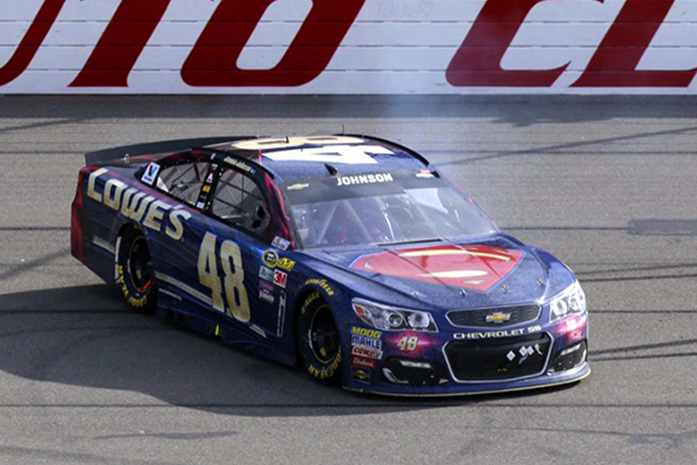 2016 Jimmie Johnson #48 Lowe's Superman / California Win / Raced Version / Chevrolet SS NASCAR diecast, by Action. 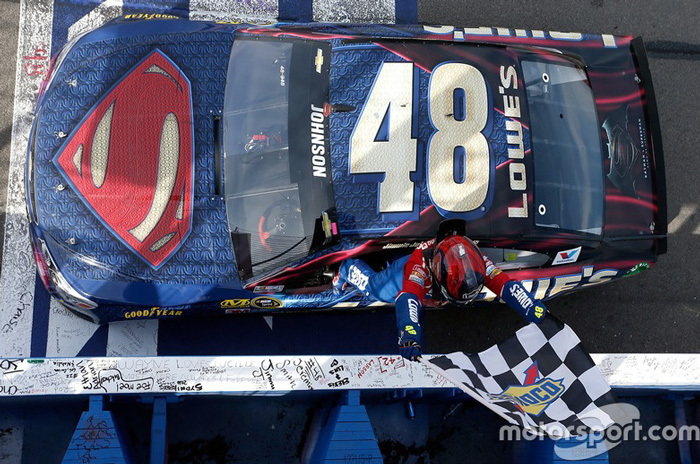 Jimmie Johnson raced this Hendrick Motorsports #48 Superman Chevrolet SS to victory in the NASCAR Sprint Cup, Auto Club 400 at Auto Club Speedway (California) on March 20, 2016. 2016 Brandon Jones #33 Nexteer Automotive / Chevrolet Camaro NASCAR diecast, by Action. 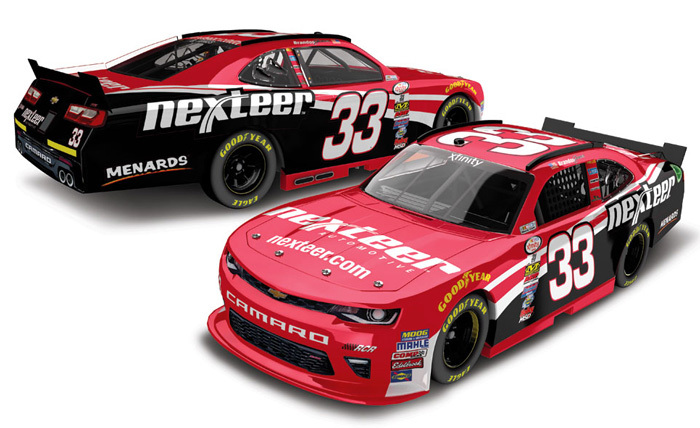 The Richard Childress Racing #33 Nexteer Automotive Chevrolet Camaro was raced by Brandon Jones in 4 races during the 2016 NASCAR xfinity Series season. 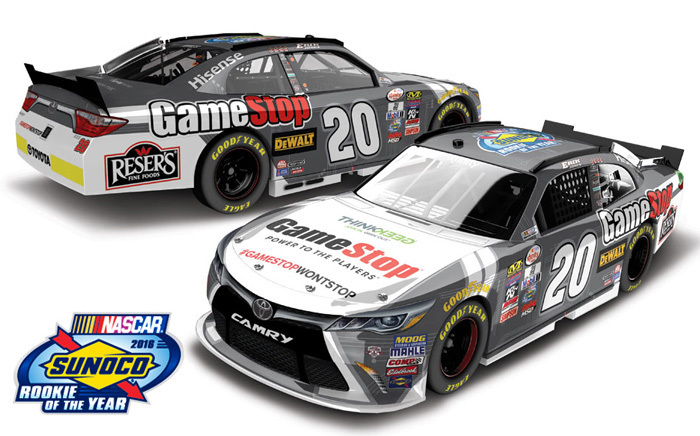 2016 Erik Jones #20 GameStop / NASCAR Rookie of the Year / Toyota Camry NASCAR diecast, produced with a Galaxy special finish by Action. This diecast car features the 2016 NASCAR Sunoco Rookie of the Year logo on the roof. Erik Jones, the 2016 NASCAR xfinity Series Rookie of the Year! 2016 Kasey Kahne #5 Farmers Insurance / Chevrolet SS NASCAR diecast, by Action. The Hendrick Motorsports #5 Farmers Insurance Chevrolet SS was raced by Kasey Kahne during the 2016 NASCAR Sprint Cup season. 2016 Kasey Kahne #5 Great Clips / Chevrolet SS NASCAR diecast, by Action. The Hendrick Motorsports #5 Great Clips Chevrolet SS was raced by Kasey Kahne in select events during the 2016 NASCAR Sprint Cup season. 2016 Kasey Kahne #5 LiftMaster / Chevrolet SS NASCAR diecast, by Action. The Hendrick Motorsports #5 LiftMaster Chevrolet SS was raced by Kasey Kahne in 3 events during the 2016 NASCAR Sprint Cup season. 2016 Kasey Kahne #5 Quicken Loans / Chevrolet SS NASCAR diecast, by Action. 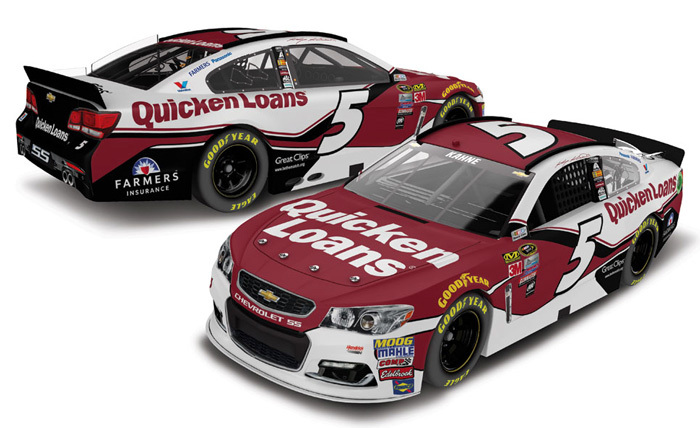 The Hendrick Motorsports #5 Quicken Loans Chevrolet SS was raced by Kasey Kahne in 3 events during the 2016 NASCAR Sprint Cup season. 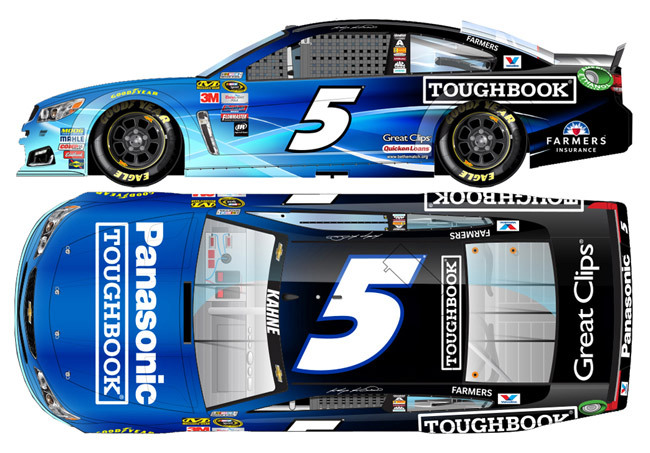 2016 Kasey Kahne #5 Panasonic / Chevrolet SS NASCAR diecast, by Action. The Hendrick Motorsports #5 Panasonic Chevrolet SS was raced by Kasey Kahne in select events during the 2016 NASCAR Sprint Cup season. 2016 Brad Keselowski #2 Wurth / Ford Fusion NASCAR diecast, by Action. 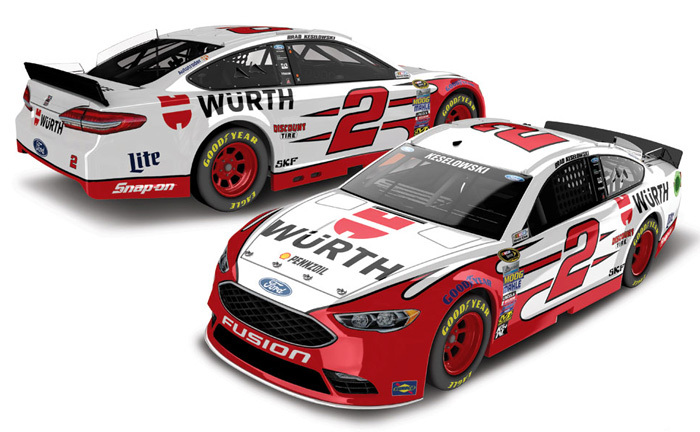 The Penske Racing #2 Wurth Ford was raced by Brad Keselowski in select events during the 2016 NASCAR Sprint Cup season. The 1/64 scale car does not feature the Miler Lite logo and the spoiler is red, not black. 2016 Brad Keselowski #2 Alliance Truck Parts / Ford Fusion NASCAR diecast, by Action. 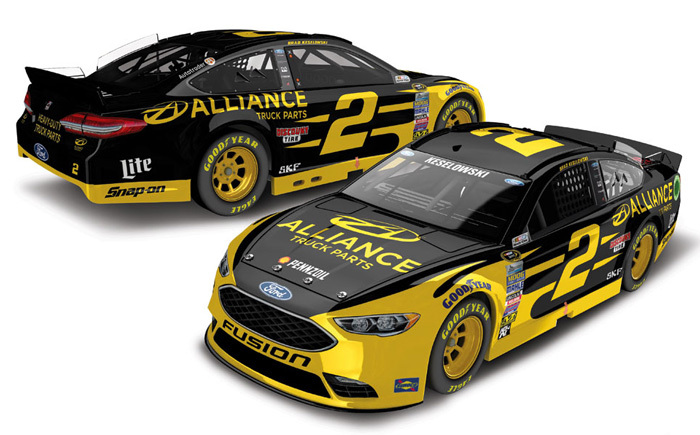 The Penske Racing #2 Alliance Truck Parts Ford was raced by Brad Keselowski in select events during the 2016 NASCAR Sprint Cup season.